The big day arrived. We traditionally hold the Installation dinner at our spiritual home of Vintners’ Hall. The dinner had been in planning for many months with eat-throughs at Vintners’ Hall and wine-tasting with the Spirit & Wine Committee. I decided to be radical by serving Neudorf Chardonnay, which is a wine I have admired for a number of years. Yes, we served a New World wine! Organising speakers is also daunting but I knew Steward Jonathan Orr Ewing would hit the mark perfectly. My guest speaker, Andrew Garthwaite, is an old friend and I have often seen him present to fund managers many times, but what would he be like as an after dinner speaker? I had no worries that Liveryman Canon David Parrott would provide an apt Grace. I arrived at Vintners’ Hall for the rehearsal for Installation Ceremony and then straight in to our November Court meeting with many topics to digest for the future. We granted the livery to six people of which, encouragingly, three were women. Then the Installation Ceremony itself and it was great to be joined by the new Warden team of Martin Riley, Kenny MacKay and Jonathan Driver. I also presented my wife Philippa with her badge as Mistress – a badge first presented by my uncle Norman to his wife Ann in 1988. The welcoming line before the dinner is always fun as you see old familiar faces and meet new guests. We were graced by the presence of His Excellency the Portugese Ambassador. That was very appropriate as the Court Trip in March 2018 is to Madeira. I am also pleased to say that both my sons Leo and George made it to London for the evening, although they were rather perplexed by the Loving Cup. The dinner itself flew by but I was delighted to sit next door to Alderman and Distiller Vincent Keaveny and it was fascinating to hear his views on what was going on in the Mayoralty and Corporation. 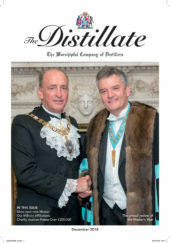 Although 80% per cent of liverymen are in the drinks trade it is important for us to keep our connections with the City of London. The speeches seemed to be well appreciated by the lively audience and then on to the Stirrup Cup. Bed was well after midnight with my new Mistress. I had a busy day as Master-Elect the day before the Installation. I presented a proposal of a Livery Common Investment Fund to 150 people at a Pan-Livery breakfast meeting at Mercers’ Hall including the Lord Mayor, Sheriffs, Masters and Clerks. This was followed by a dash to a packed Westminster Cathedral for the Festival of St. Cecilia in aid of Help Musicians. The Master then very kindly gave lunch to those Distillers attending. Then finally back to the Mansion House for the new Lord Mayor’s briefing to Masters. He emphasised the need for better communication by the Livery movement and a likely charity focus on helping the employability prospects for the less fortunate.